This is an FYI more than anything. The cheapest frame selection Specsavers carry are £25 - the frames + lens are completely free if you're eligible for NHS vouchers and have an uncomplicated prescription (ie, not bifocals/varifocals etc). I normally buy from Goggles4U as the cheap selection is usually not to my taste - as it wasn't last week, but Specsavers seem to have new frames in! I went for the Cat Eye pair, the maroon frames, third pair down - also seventh pair down. The Black Cat Eye pair above them (second frames down) are nice too - these weren't there yesterday so I assume they're are quite new, and there's a few other new ones. Picture from Trongate, Glasgow this afternoon (Womens' Styles) Specsavers are actually advertising these cat-eye £25 frames at the moment, (the frame I chose) on a bus shelter near the store! With me, I paid £36.50 on top for varifocal lenses (my close-up sight is going a bit these days), but as mentioned if you have an NHS voucher and uncomplicated prescription with the £25 frames, they won't cost a thing. It was finding (cheap) frames I liked that was the problem, but I don't have an Asda close enough by to see what they offer. Again, the offerings in your Asda store may be different. As promised, added the Mens' £25 frames to the original post - also more of the Womens' £25 offerings. Still from the Trongate, Glasgow store. I have a receipt for my purchase (mentioned above). There were no hidden charges yesterday (when I purchased my varifocals). No hard sell, either. No problem giving me my prescription for internet ordering (the Tesco Optician a few years ago was notably snotty when I was honest) and they happily adjust my glasses, no matter where I've purchased them from. 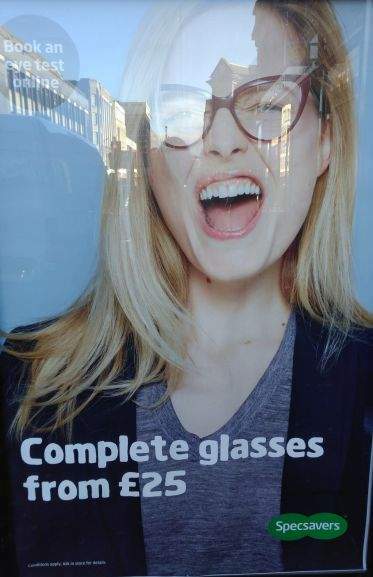 Maybe it depends on your store, but I think my local Specsavers is great. I picked up my Maroon Cat Eyes last week - my first Varifocals. Bit disappointed G4U removed my review (it was there for a few hours) but I've shopped with them for years and their customer service is great - second time lucky, I hope.